Norton Sound, Port Clarence, and Kotzebue Sound management districts include all waters from Point Romanof in southern Norton Sound to Point Hope at the northern edge of Kotzebue Sound, and St Lawrence Island. These management districts encompass over 65,000 square miles, and have a coastline exceeding that of California, Oregon, and Washington combined. Approximately 17,000 people, primarily Alaska Natives, reside in 30 small communities within these management districts. Nearly all local residents are dependent to varying degrees on fish and game resources for their livelihood. Chum and pink salmon are abundant in Norton Sound and smaller populations of sockeye, coho, and Chinook salmon are also present. 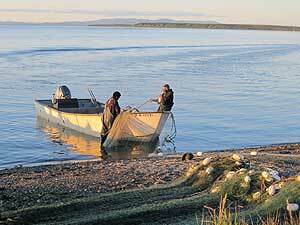 Only chum salmon are found in sufficient abundance to support commercial fishing in Kotzebue Sound. Small, isolated populations of salmon are found north of Kotzebue Sound. Herring are present in all three management districts; Norton Sound has the largest abundance of herring in the entire AYK Region. The remote location of these herring stocks, and their later timing relative to other herring stocks, makes attracting buyers difficult for these fisheries. An important commercial and subsistence king crab fishery takes place in Norton Sound. This fishery was restricted to small boats in 1993 and designated a super exclusive fishery in 1994, which means that a vessel registered for the Norton Sound king crab fishery cannot participate in any other king crab fishery during that year.